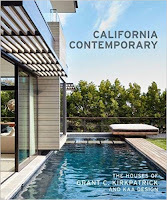 A sumptuous book celebrating the Californian modernist houses designed by Grant Kirkpatrick and his KAA Design company. Twenty-four are featured in a slightly different way from the usual architectural format, here there are many close-ups of sections of a house to reveal interior space, structural aspects, material, glass and lighting. A common feature is the concept of allowing the pleasant Californian climate into the building either with large open access or huge areas of glass. All the houses are custom designed and Kirkpatrick writes a short intro for each with his thoughts on how he designed the property in relation to the site and the needs of the client. One remarkable hillside residence (inspired by Case Study Programme from the mid-forties) includes a two lane bowling alley. Obviously several have a water feature or swimming pool. The book's large size allows the many spread wide photos to show off the exterior and interiors (though predictable there are no people in sight) and most of the photos include interesting long captions. Some pages have illustrations of the a project and there are house plans, perhaps a bit small to appreciate the detail and minus any key for the various rooms. Kirkpatrick says in his Preface that, since 1988, he has designed hundreds of California buildings, this work book reveals how his interesting ideas turn into unique wonderful homes. A beautiful celebration of this exuberant architectural style across Canada. The book has an interesting chapter arrangement: Life at work; Life in the community; Life at home; Life as a shopper; Life on the move; Life of leisure. Within these there are one hundred and fifty buildings selected and nicely it's not only ones in big cities but small towns also. I thought the real strength of the book is it's comprehensiveness. Obviously the well known city office towers are here but also factories, government buildings like a post office or police station, schools, exhibition halls, bus stations, airports, gas stations, bridges, movie houses and of course plenty of private homes. At the start of the book the author provides a succinct ten page illustrated essay defining art deco architecture, useful because as I looked at the photos I was curious about this or that aspect of a building, there is a three page Glossary at the back of the book that really should have been included with this essay. Each building is named with its address (very handy is you use Street View and want to see what it looks like now) architects and year it was built. There are contemporary exterior color photos with plenty of close-ups of interesting detail. Interiors are featured especially lighting, floors and furniture. The Life at home chapter has some wonderful deco apartment blocks and individual homes including the stunning Loane House in Kelowna, British Columbia, there is a photo of a doorknob with its back plate and a one of a cupboard hinge which are fine examples of the style right down to the speed lines and step-backs. Churches are not normally associated with art deco but seven are included. Ste. Philomena of Rosemont Church in Montreal has a remarkable interior with beautiful sconces, the cloister of the Benedict Abbey of Saint Benoit-du-Lac has an extraordinary floor of colorful glazed tiles in a deco pattern. The last chapter, Life of leisure includes several theaters where architects have used the maximum deco styling options to create a distinctive presence on a street. 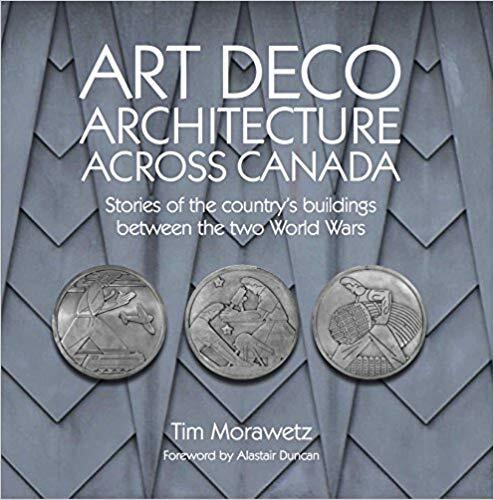 Tim Morawetz, in this book with 420 color and 100 mono photos, has written the definitive book on Canadian art deco from the twenties to the fifties. My only disappointment is why is it so expensive? 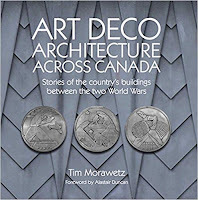 His previous book on the deco structures of Toronto is equally costly.